Today's been one of those busy days filled with not-so-fun things that you're obligated to get done...like...taxes. Although it's chilly and gloomy outdoors, the gorgeous shade of pink peeking from the petals of a tree outside my window gives me hope that spring is on the brink. Which...makes me want to bake. So, I'm going to make quite the inevitable mess in my cozy little kitchen and whip up this new recipe passed along from my friend/fellow cooking connoisseur Kendall. 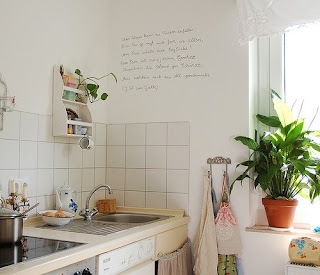 The only thing that could make this afternoon a teenie bit more indulgent is if I was baking away in this lovely kitchen, found via Set Design Thinking. And hopefully, if all goes well in that kitchen of mine, I'll have some lovely pictures of my new confections to show on Monday. Happy Weekend!! mmmm... 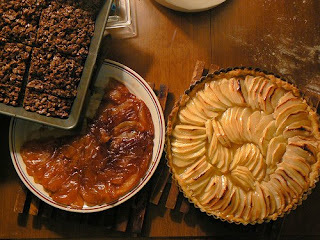 I want the apple tart pie or whatever that is in the photo. I'm craving apple pie with cinnamon. Hope your red velvet cookies turn out yummy! I have just found your blog and love it! It is going to be a style inspiration for sure! Have you thought about adding the 'followers; gadget so people can keep track of your posts? Thanks so much for the compliment! I'm really excited about this little venture & am so glad you love it. And thanks for the suggestion--followers has been added!